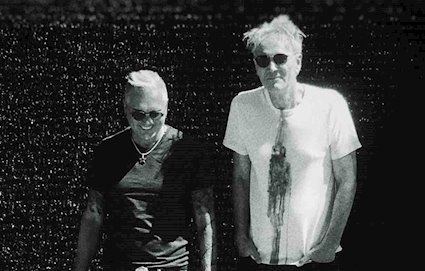 Black Needle Noise has unveiled the new video for ‘Shiver of Want’ with Bill Leeb of Front Line Assembly and worldwide charting dreampop collective Delerium. In the world of post-punk and industrial music, thesee are two key personalities that have consistently been putting out quality music. Legendary artist-producer John Fryer, the mastermind behind this project, met up with Bill Leeb in Norway after a Front Line Assembly gig. They hit it off right away and found a really good friendship in the making. While it did take over a year or so for the stars to line up, they eventually did. The new video was shot in 3 countries: Norway, Germany and the USA. "This track made history for me because, even though I have worked with countless artists over the years and really value the concept of collaborating, I personally had never sung on a one-off collaboration. I have said no to quite a few offers over the years. But when John approached me, it just felt right. With his background I thought we could do something interesting without having to worry that we were looking for a radio hit, but rather make it a journey into an artistic creation," says Bill Leeb. "To me, the lyrics are like you are peering through a looking glass at your life, as if it were a third person. You are trying to grasp its fluidity as it slips through your mind and soul, having absolutely no control of where it is truly taking you on its final journey. Somehow one tries to come to terms with this, but it never gives you a clear picture or resolves in your subliminal state or dreams. Everyone knows it will end, but I do hope somehow a realm of consciousness will arise and we can all dream for eternity through our spirits. Yes maybe this sounds a bit optimistic, but we need to find hope in one form or another. A shiver of want." This new video follows up videos for ‘And Nothing Remains’ with Ana Breton (Dead Leaf Echo) and ‘Neon Noir’ with Dr. Strangefryer, which matched 80s-style synthpop with retro-fitted video colorama graphics courtesy of Alisa Akay.